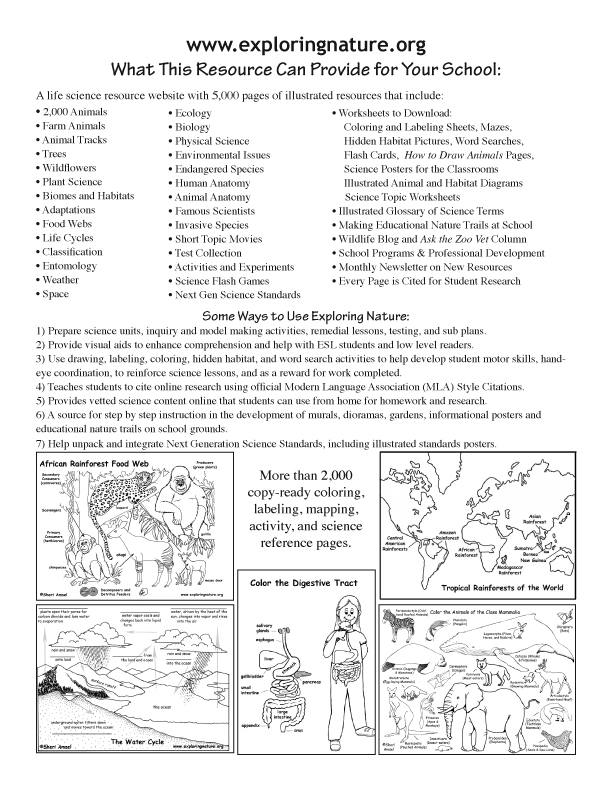 • 6,000 pages of life science, Earth science, physical science, biology, anatomy, and ecology for K-12 lesson development, sub plans, and student research. • 10,000 vibrantly illustrated science models, posters and other visual aids. • Science activities, experiments, investigations, movies, games and worksheets. 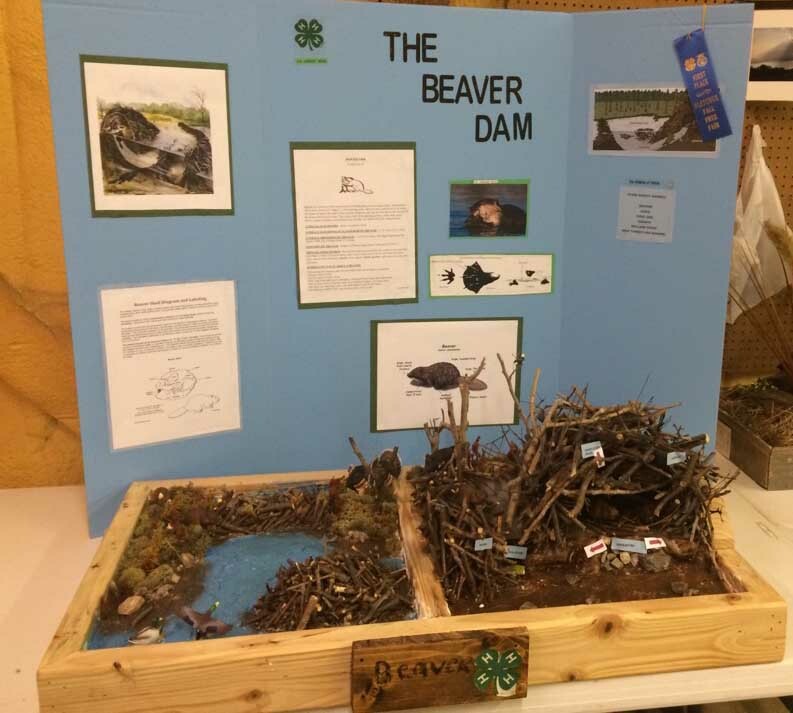 • Instructions for how to draw animals, make habitat murals, develop dioramas, create posters, nature trails, trail maps and guides. • Test bank, glossary and Next Generation of Science Standards resources listed by grade. 1) Prepare science units, inquiry and model making activities, remedial lessons, testing, and sub plans. 2) Provide visual aids to enhance comprehension and help with ESL students and low level readers. 3) Use drawing, labeling, coloring, hidden habitat, and word search activities to help develop student motor skills, hand-eye coordination, to reinforce science lessons and vocabulary. 4) Teaches students to cite online research using official Modern Language Association (MLA) Style Citations. 5) Provides vetted science content online that students can use from home for homework and research. 6) A source for step by step instruction in the development of murals, dioramas, gardens, informational posters and educational nature trails. 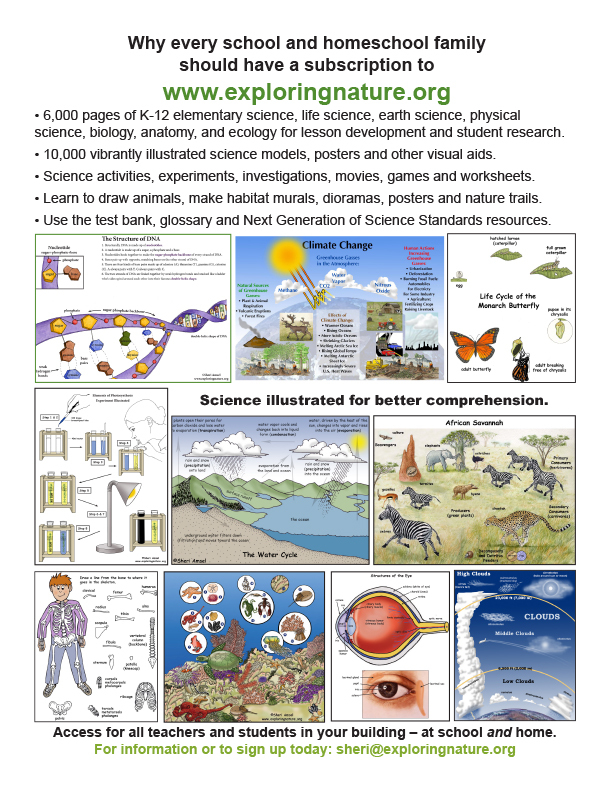 7) Help unpack and integrate Next Generation Science Standards, including illustrated standards posters. 8) Access to Exploring Nature's artwork for your educational projects. Ask about a complimentary license for subscribers only. *Use the PDF at bottom to print out the flyers and share them with your school administration.